After a cold first half, the Flames basketball team was on fire in the second half of action, making their first eight shots and scoring on nine of their first 10 possessions, en route to their seventh straight victory Monday night, Jan. 21. 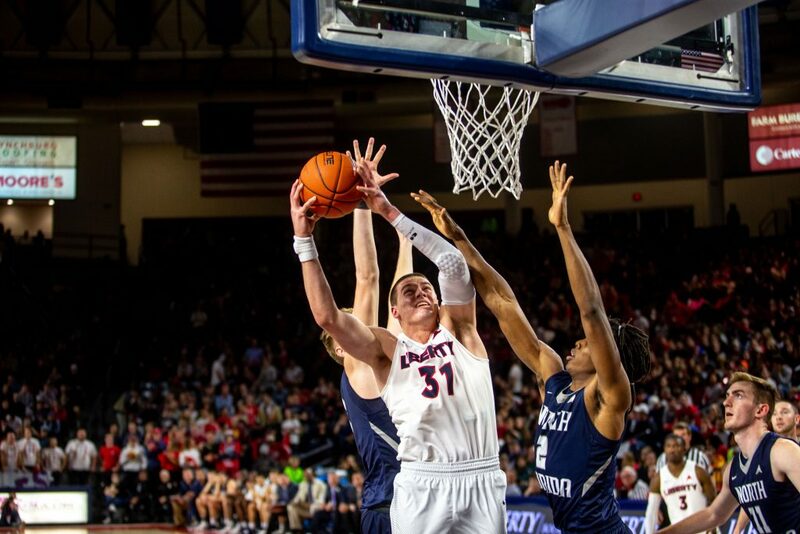 The blazing second half saw Liberty shoot 74 percent from the court, which helped balloon their 7-point halftime lead into a 72-47 victory over North Alabama. Senior guard Lovell Cabbil’s performance reflected the team’s performance, as he headed into the locker room with just three points the first half, but erupted for 17 of his team-high 20 points in the second half. Cabbil, a senior captain on the team, is also considered one of the Flames best on-ball defenders and showed his skills on both ends of the court. Cabbil’s night was highlighted during a sequence in the second half when he blocked North Alabama’s Jamari Blackmon on defense before crossing Blackmon over and nailing a 3-pointer that sent the home crowd into a frenzy. Cabbil would not take all the credit for his performance. He praised his teammates, who set good screens and helped get him open all night. Before getting heated up in the second half, the Flames sputtered a bit out of the gate. Liberty accumulated seven turnovers through the first 13 minutes of action and shot just 2-for-13 on 3-pointers. Despite shooting 34.6 percent from the field in the first half, Liberty would take a 26-19 lead into halftime thanks to their stellar defense and balanced scoring. The Flames defense forced nine North Alabama turnovers and allowed just three UNA players to score in the first half, while they had seven players tally points before halftime. TAKEOVER — Redshirt junior Scottie James earned ASUN co-player of the week recognition. One of the Flames held scoreless in the first half was star forward Scottie James, who shot 0 of 4 and turned the ball over several times in what was a forgettable half. After coming out of the game briefly when he landed awkwardly on his knee late in the first half, James returned and played much better in the second half. The six feet eight inches forward would tally seven points and three rebounds in the final 20 minutes. Liberty’s bench also played a key role in the lopsided victory, outscoring North Alabama’s bench 20-8. No one provided a bigger spark for the Flames than senior transfer student Keenan Gumbs. Gumbs played all over the floor for the Flames, providing key minutes during a tough stretch in the first half. With just under five minutes remaining, Gumbs threw down a dunk in transition that reignited the home crowd and sparked an 11-2 Liberty run to end the half. The Flames also had valuable minutes from redshirt-juniors Caleb Homesley and Myo Baxter-Bell. Homesley put up 15 points and nine rebounds in 30 minutes of action, while Baxter-Bell tied his career-high with five assists. North Alabama was led in scoring by guards Christian Agnew and Jamari Blackmon, who each scored 13 points. The 47-point performance marked the lowest scoring game of the season for UNA. The Lions will look to rebound Thursday at home against Kennesaw State. Monday’s win gave Liberty a 7-0 record in conference for the first time in team history and marked the first time since the 2007-08 season that the Flames have started 10-0 at home. While the team is taking one game at a time and not getting ahead of themselves, they are starting to realize that what they are doing this season is special. The Flames move to 19-4 overall. They face Lipscomb on Tuesday, Jan. 29, at 7 p.m. in the Vines Center.